I am back again with a stylish yet super comfortable outfit from my favorite online shopping website Romwe! Romwe has a huge collection of stylish and quality clothes at great offers! I had featured many outfits from this online shopping website. Just type Romwe in the search and you will get all the posts! 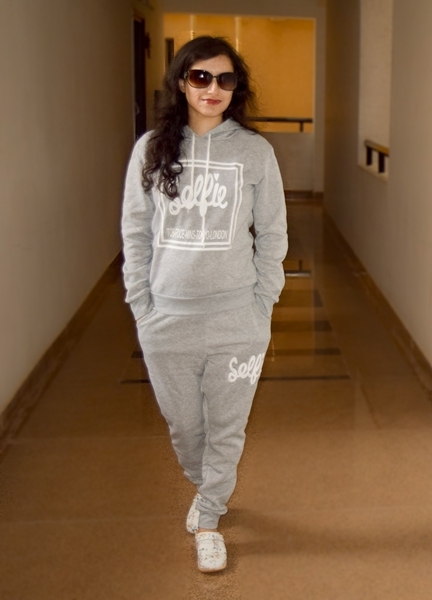 This outfit is a two piece outfit with a hooded top and comfortable pants! I rarely wear grey color but when I saw how comfortable it will be during the morning, I could not resist myself from ordering it. It is made of polyester and feels very soft and comfortable against the skin! Though it is written that the outfit is meant for summer but I feel it will go great when the weather is slightly chilled. These days I literally do not like wearing jeans or anything with strings and I was happy that the pant had elastic that stretches really well! I ordered size M and it is a bit fitted to me though not very uncomfortable! I think I should have ordered size L. I would request the brand to correct its size charts for this particular outfit! You can wear this outfit during morning walks, jogging or when you are just strolling around! It is very casual and comfortable and looks stylish at the same time! 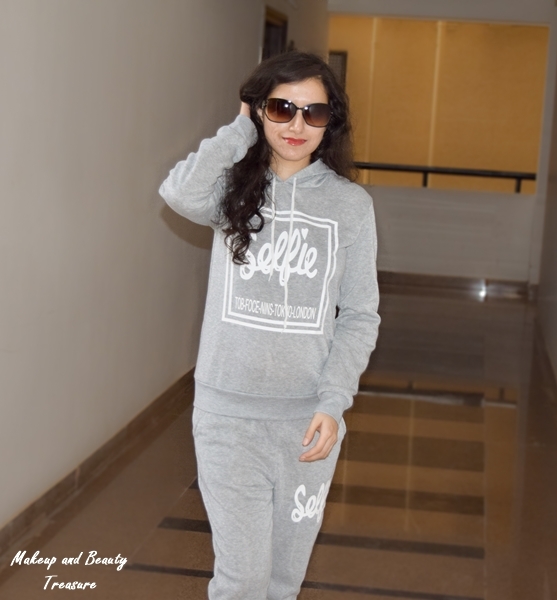 It has 'selfie' written on top and pants though I am really bad at taking selfies #lol. Romwe provides worldwide shipping and I got my parcel within few days with no customs charges! Do you like wearing such kind of outfit? Have you shopped from Romwe? Super stylish,.. I always love Hooded tops,..